The Richardson Maritime Museum is excited to welcome the Maryland Dove back to Cambridge! James B. Richardson and five assistants worked for 15 months on the Maryland Dove at his boatyard off the Choptank River on Lecompte Creek near Cambridge, and it was launched and commissioned in 1978. 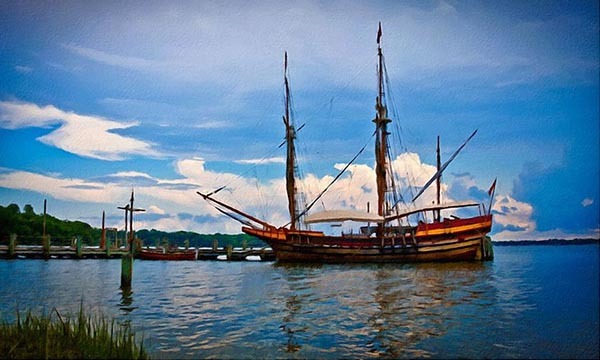 The tall ship is a re-creation of the late 17th century trading ship that brought the first settlers to what is now Maryland. The Maryland Dove is owned by the state of Maryland and is operated and maintained by the Historic St. Mary’s City Commission. The visit to Cambridge coincides with the Maryland Dove’s 40th Anniversary. The planks will be down from 10am to 5pm on Sept. 8-9, and the ship will be open to the public for tours while it is at Long Wharf, near High and Water Streets. Donations will be accepted.